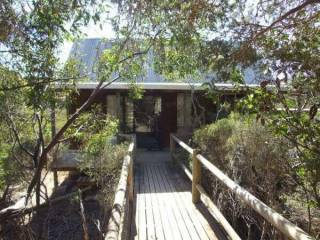 An ideal base for visiting Seal Bay Conservation park, Little Sahara, Kelly Hill Caves, Remarkable Rocks and Flinders Chase National Park and 10 minutes drive to the fabulous Vivonne Bay beach for surfing, fishing, fun golf and other attractions. 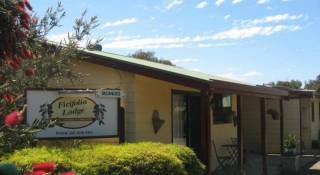 Seal Bay Cottages and Café is situated in a beautiful location, on 35 acres of land, half an hour from Kingscote, in a tranquil rural setting nestled among native gum trees and a winter lagoon. Water birds, wild flowers and native animals are on your doorstep depending on the season. The Seal Bay Cottages reception is located in a historical cottage, which used to function as Kangaroo Island's first Post Office. The property features 7 nicely furnished self contained cottages that are well appointed and equipped to make your stay comfortable. Situated on the major tourist route of South Coast Road, immediately opposite the Seal Bay Road, this is the closest accommodation to the Seal Bay Conservation park. Our tranquil self-catering cabins situated around a winter lagoon . Each cabin is nestled in the native bushland with an outlook perfect for observing the native birds and wildlife. Six self contained cabins features: two bedrooms, one room with double bed, one room with 4 beds (bunk beds). Each cabin occupancy is up to 6 guests. One deluxe cabin includes a large room and large shower and toilet. The deluxe cabin has access for disabled guests. Private verandah , with chairs and table. Shared laundromat with washing machine and dryer. Our fully-licensed in-house restaurant, is open for breakfast, lunch and dinner and serves a variety of meals including local produce and alcohol. You are welcome to enjoy the panoramic view from the restaurant. If cancelled or modified up to 1 day before date of arrival, 50 percent of the total price of the reservation will be charged. All older children or adults are charged AUD $25 per person per night when using existing beds. Default InternetNo internet access available. Breakfast, lunch and dinner are available at most times. To ensure availability, guests should contact reception to confirm meal bookings. Conveniently located on South Coast Road adjacent Seal Bay Road. The closest restaurant and accommodation to the famous Seal Bay conservation park. The first restaurant to stop at when traveling directly from Penneshaw to Seal Bay.